Multi-award-winning, international bestselling writer and artist Lauren Child will visit two schools in Portsmouth on Tuesday 15th November. She will visit Solent Infant School and Copnor Primary School to talk to Reception, Year 1 and 2 pupils in an event which has been organised by The Hayling Island Bookshop in partnership with Portsmouth School Library Service. Her Charlie And Lola books are known and loved the world over and Lauren has also written the Clarice Bean series of picture books and novels and a new series for ages 6 to 12 featuring secret agent Ruby Redfort. 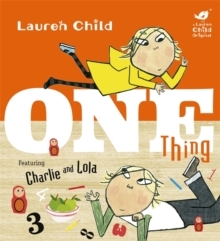 Lauren is visiting Portsmouth to talk about her latest Charlie And Lola book One Thing, a picture book which introduces counting and numbers to younger readers. After her talk Lauren will meet the children and sign and dedicate books. Although you won’t be able to meet Lauren personally unless you are at the above schools, you can call the Hayling Island Bookshop and pre book copies of the new Charlie And Lola book One Thing or books in the Ruby Redfort series, which the Bookshop will arrange to have signed and dedicated by Lauren while she is with them in Portsmouth. Customers will be able to collect their signed books from the Bookshop. Call the Bookshop on 02392 466620 to pre book your copy and tell them how you would like Lauren to dedicate your copy.